Our carving kit gets you from the oven to the serving platter presentably, safely, and without making a mess. 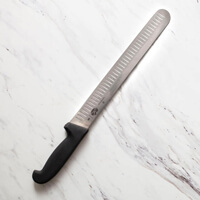 A lovingly prepared chicken, turkey or roast deserves to be properly carved. 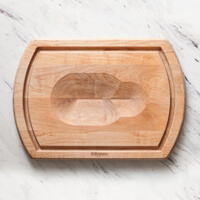 Our carving kit gets you from the oven to the serving platter presentably, safely, and without making a mess. Published in Cook's Illustrated Magazine May 2015 We rated slicing knives on handle design, blade design, sharpness, and agility. 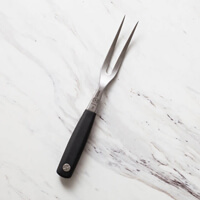 In the process of slicing hundreds of pounds of turkey breast and roast beef, we valued comfortable, grippy handles; the right level of blade flexibility; taller blades; and a narrow bevel. BLADE ANGLE 15° BLADE HEIGHT 1.5" BLADE LENGTH 12"
Published in Cook's Illustrated Magazine November 2012 The sharp, V-shaped prongs of this curved carbon steel fork held firmly to roasts while staying out of the knife’s way, worked well for transferring slices to a platter, and didn’t bend when lifting or turning roasts. Its rounded nonslip rubber handle felt secure and comfortable. MATERIAL High-carbon steel prongs, Santoprene (rubber) handle PRONG LENGTH 3.75" OVERALL LENGTH 10.5"
Published in Cook's Illustrated Magazine March 2016 We rated each board on its liquid capacity, cutting surface, ease of use, and ease of cleaning. In addition to carving 15­ pound turkeys and 5­ pound roast beefs, we also poured 1⁄2 cup of water onto each board to approximate the juices released by a midsize turkey. 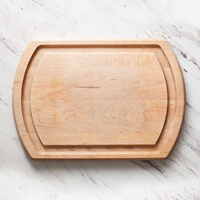 We noted design features that made carving more challenging, tested knife marks after repeated slices, and kept track of the effort required to maneuver and clean each board. WEIGHT 5.75lbs MATERIAL Maple DIMENSIONS 20" x 14" x 1.25"
Despite the cliché of the head of the household slicing at the table, carving is a messy job. Better to get down and dirty in the kitchen, where you can break down the turkey and carve neat, picture-perfect slices without anyone seeing. To serve the meat, transfer it to a pretty platter and bring to the table. Be sure to let the roast turkey rest before carving it. The resting time not only allows the juices to redistribute, it also makes carving easier. Use a platter large enough to hold all the meat, and warm the platter prior to carving. Line the platter with kale or another sturdy green for an attractive presentation. Transfer the turkey to the platter as you carve, using the flat side of the knife. Keep the meat on the platter covered with foil as you carve the turkey. After you've served the Thanksgiving meal (and made a wish on the wishbone), be sure not to discard the turkey carcass. Store it in the refrigerator (it will hold for a day or two) and then use it to make turkey stock. Nothing could be more economical or delicious. Try not to use a barren carcass for the stock. The stock will taste best made with a carcass that has a good amount of meat clinging to it. And once the stock is done, make sure to pick off the bits of meat still clinging to the carcass. They will make a delicious addition to turkey soup.